I bought a package of fragrant quick wipes for animals with the brainy idea of giving my cats a kind of bath. Man they are smart animals! I opened the package and withdrew two, looking around the room and wondering who I should get first. As soon as I got out of my chair Woofy took off like a bat out of hell, and I haven't seen him since. Gin Gin was nowhere to be seen so I made a grab for Jezzie. Have you ever tried to wipe down a wiggling cat? I did it in record time, got a good scratch from her back nails for my efforts, and she took off for sights unknown. I eventually got Gin Gin. To my surprise she tolerated the wipe down fairly good. I'm still looking for Woofy. In the meantime I have two wipes sitting at the side of my chair just in case he forgets I'm looking for him and comes to me first. He's the chicken in the middle. I actually had a cat who did not mind these of even being sprayed with the waterless bath (which is in a bottle like body spray). Btw, your cats are beautiful! I laughed. Good luck with the wipe-down. Cats are very smart. Thank you June. They're spoiled, too! I love the picture of your kitties! I now have only 2 out of the 4 I use to have up until the spring of 2009. My two older Siamese boys were Whiskey and Soda. Whiskey was 19 and his younger brother Soda was almost 18. They had the same parents but they were a few months apart in age from different litters. They were our loves and I want to write tribute of love to them soon and place it on my blog. They were the oldest of our family of pets out all 7 of them We did have 7 , and now we are down to 5. Our animals traveled all over with us, and I am so happy we had them in our lives. Whiskey died in my arms one early morning, and his passing damn near broke me. Two days later his brother missed him so much that he literally followed behind him in my husbands arms. 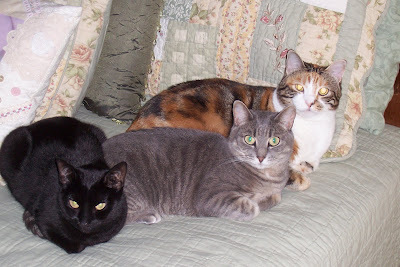 We have left in our group 2 female kitties we rescued almost 10 years ago, and 3 small dogs as well. Thank you for sharing your books and your kitties with us!